IKEA FAMILY is a card for every home lover and, most importantly, it’s our way to say ‘thank you’ for being together. The programme is free to join and has no loyalty points, so every member of our family gets equal rights, privileges and rewards. Start taking advantage of all the great IKEA FAMILY member benefits - once you receive your membership card make sure to show it every time you go to the IKEA store or visit our restaurant. Show your IKEA FAMILY card at the restaurant on weekdays and enjoy a cup of free coffee or tea! Special offers at special prices at our restaurant and the Swedish Food Market. IKEA FAMILY card offers a possibility to acquire certain IKEA goods at special prices. Take note of the special price labels at the store – special offers are updated on the monthly basis! 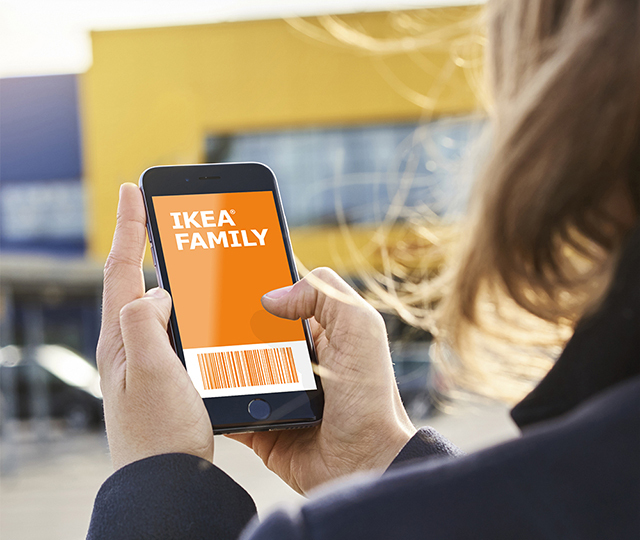 Insure your goods against any accidental damage during their transportation – show your IKEA FAMILY card when paying for your goods. Enter your e-mail address and agree to direct marketing when filling in the questionnaire and be the first to receive all our news. With your IKEA FAMILY card your child's playing session at Småland will be extended by 30 minutes (this depends on the number of children playing at that time). Be ahead of everyone else at the SALE! Acquire the goods at the SALE prices one day ahead of those who do not hold the IKEA FAMILY card.